In the 1970's Guthrie embarked on a series of bold abstract paintings and silk screen prints which she referred to as her "Camelot" series. Although the prints were usually preceeded by oils or collage with gouache the Camelot series evolved mostly around the possibilities offered by silkscreen printing where layers of pure colour could be laid over one and another without bleeding or distortion. Guthrie was introduced to the technique of silk screen printing as early as 1954, by Linnet Guthrie, the daughter of her first husband Robin - by the early 1970's she had mastered the art and become one of the most accomplished practioners of any generation. Her early prints, like her paintings of the period, where semi abstract stylized decorative conversation pieces, such as The Pram (1954) or Two under one hat (1954). At the beginning of the 1960's, after her husband Cecil Stephenson suffered a stroke and was no longer able to paint, Guthrie launched into pure abstract painting. From the textured, soft edged and muted palette of the 1960's she progressed towards a hard geometric style which was increasingly inspired by her husband's work. 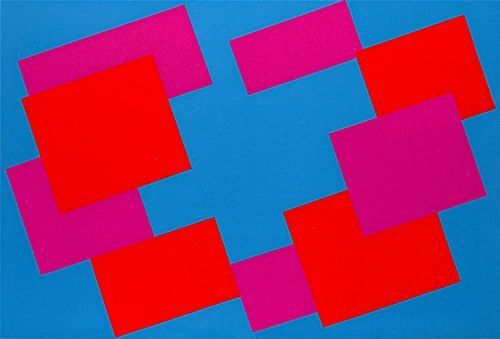 She used the medium of silk screen printing both to reproduce some of the iconic abstracts of Stephenson from the 1930's (From a painting in Egg Tempera by Cecil Stephenson, 1936) through to abstract reproducing compositions with daring colour combinations of her own design, such as seen in the Camelot series. The silk screen prints are almost always most successful than the large oil paintings which preceeded them.